The beauty of trampoline jumping is that it’s not only fun, but phenomenally good for you too. Physical health is important, but so is making time for recreational activities, and trampolines allow us to take care of both at the same time! It’s a simple activity that appeals to all ages and leaves you feeling energised. Here are eight reasons taking a jump on the trampoline regularly improves your health. One of the biggest obstacles in the way of good physical health is motivation. Trampoline jumping makes staying healthy fun, which means you’re more likely to do it on a regular basis. It doesn’t feel like a traditional workout when you’re having a great time! The lymphatic system assists with the removal of waste and toxins within the human body, making it essential to good health and proper organ function. In order to work, the lymphatic system relies entirely on body movement to pump all the bad out. Jumping regularly gives this process a healthy boost. As a relatively high-intensity, high-cardio workout, jumping on a trampoline increases oxygen intake, which is not only essential to lung health, but also the cardiovascular system. Oxygen flow helps to purify the blood, and may improve skin tone, too. 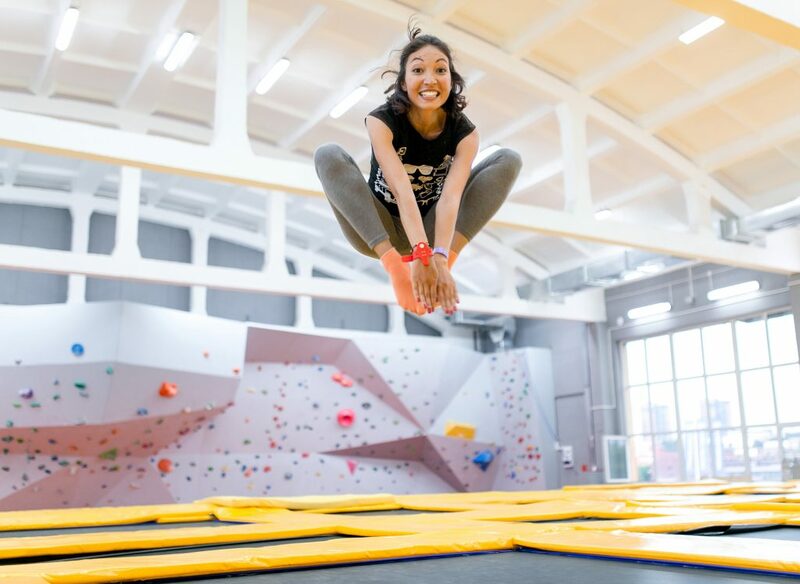 Running is often hailed as the greatest of all cardio, but did you know that trampolining is much more effective? In fact, just ten minutes of jumping is equivalent to 33 minutes of running, making it a more efficient exercise choice when it comes to burning calories. Over time, jumping regularly on a trampoline can help to improve balance and posture. With each jump you take, your body uses a combination of muscle groups, strengthening your core and assisting in maintaining an upright posture. Joints can be a problem area when it comes to injury. As opposed to running or jogging, trampoline jumping applies light pressure to the joints, which allows bones to become stronger and better at coping with pressure. This builds up your joint strength and reduces the chances of suffering an injury. If you suffer from stress or depression, trampolines are a natural, cost-efficient solution. All that jumping causes the brain to release endorphins, and the high-intensity movement removes tension from the body, resulting in relaxation and improved well-being. Jumping on a trampoline uses a variety of small and large muscles throughout the body, including the quads, calf muscles and abs. Trying different types of jumps and tricks will allow you to work on different muscle groups while improving your strength and agility. Ready to get fit on a trampoline? Topline Trampolines is a home-grown, Australian manufacturer of durable, professional-grade trampolines. But that doesn’t mean they’re reserved for the Olympians – families love the thrill of jumping on a Toplin, too. Browse our range of products online, or visit our warehouse on the Gold Coast to talk to an expert.